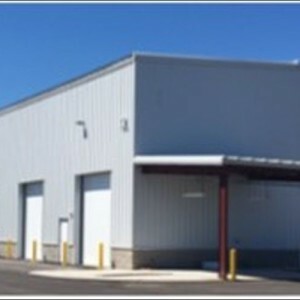 warehouse building (+/- 19,550 sq. ft.) and associated site work. The pre-engineer metal building reflects an Mid-Century Modern architectural style with a covered balcony, bold colors, large windows, custom-made perforated metal sign, and a mixture of industrial textures and materials; The lobby, a two-story space with monumental staircase leading to a balcony. 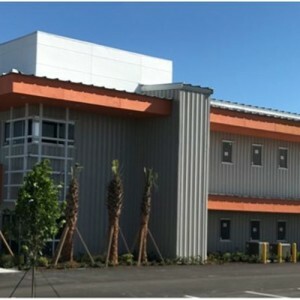 building, sidewalks, landscape and retention buffers, driveway, parking, outdoor storage, dumpster enclosure, drainage, water and sewer connections, and site lighting. The design demonstrates creativity addressing neighborhood compatibility, street frontage, quality design / architecture, and quality materials in construction. The project remains sensitive to the public by screening utilitarian aspects from public view, respecting the scale of the neighborhood and surrounding properties. 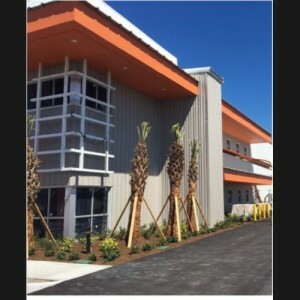 Scope of Work: The project consists of grading of the site, installation of electrical and lighting, construction of pathways, a parking area, landscaping, irrigation, fencing, site furnishings, signage and a pavilion. Scope of Work: Design and Build a state of the art 11,500 square foot hardened fire station. Scope of Work: This project consists of complete demolition of Maritime Office Building, foundation and portions of foundation oiles, adjoining hardscape and landscape areas. Copyright © 2015 West Construction. All Rights Reserved.